FREE Tom’s of Maine Toothpaste | ...and another cup of coffee. 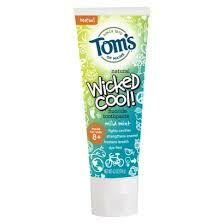 Right now you can request a FREE sample of Tom’s of Maine Wicked Cool Toothpaste through Target’s sample spot while supplies last. Samples will be sent via mail within 8 to 10 weeks.